A very worn Republican denarius issued by C.Vibius Pansa Caetronianius dating to 48 BC. 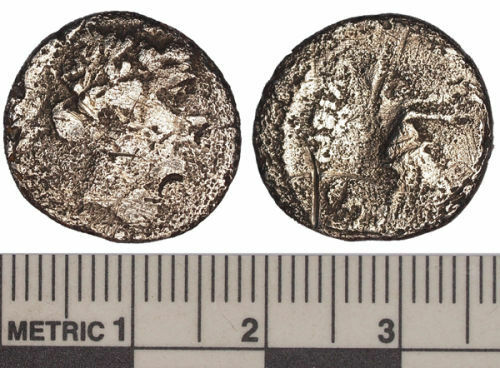 Mint of Rome. RRC 449/2. Republican moneyer: Vibius Pansa Caetronianus, C.
A silver Roman Republican denarius of C Vibius Pansa Caetronianus (48 BC), mint of Rome, RRC 449/1a. Silver Roman Republican denarius of C. Vibius Pansa minted in Rome in 48BC. RRC p. 464, c.f. no. 449/1a.